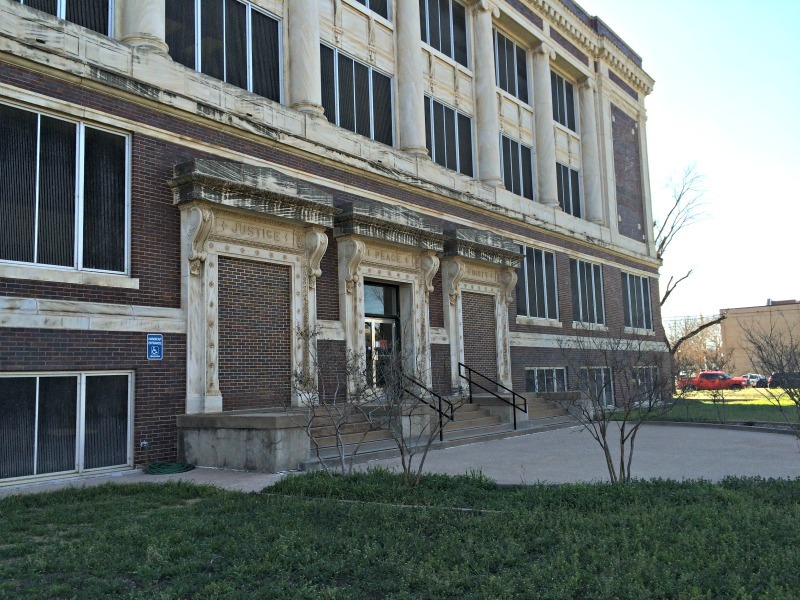 The 1915 Taylor County Courthouse in Abilene is ready for renovation but not yet restored. The three-story historic courthouse is very different from many of the state’s other courthouses. It’s a wonderful example of Classical Revival design emphasized with tall Ionic columns encircling the building. The rectangular plan with a hidden flat roof utilizes a variety of exterior materials including brick, cast stone, and terra cotta. As the only building on its block, its setting enhances its grandeur. Fittingly located on Oak Street, this sixth—but not last—courthouse for Taylor County is surrounded by trees and green spaces. It was listed in the National Register of Historic Places in 1992 as a local historic and architectural resource for the city. With only moderate building alterations through the years, it still retains its most important architectural features. 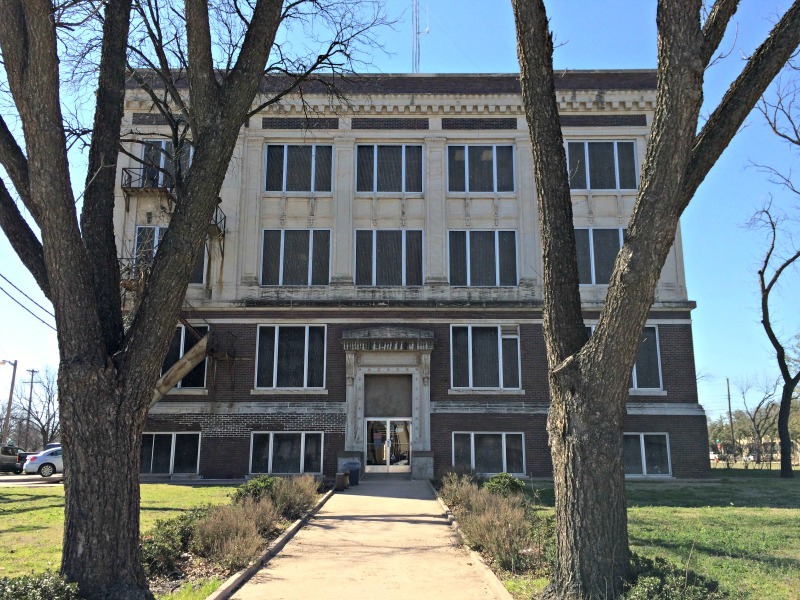 Although a new county courthouse opened in 1972, this older courthouse is still in use for offices—a testament to the lasting design of the architect, George Burnett of Waco. The interior entrance area includes historic materials: Cherokee marble on landings, treads, and risers; Georgia Pearl Marble on wainscotings and base; and handrails of cast iron with oak. Doors are quarter sawn oak with a light honey finish and bronze geometric hardware. Visitors may not notice one specific detail, but together, the doors, floors, and walls blend to create an appealing space. Special features possibly not known to the public are the spiral staircases in the Sheriff’s and County Clerk’s Office leading down to the basement. 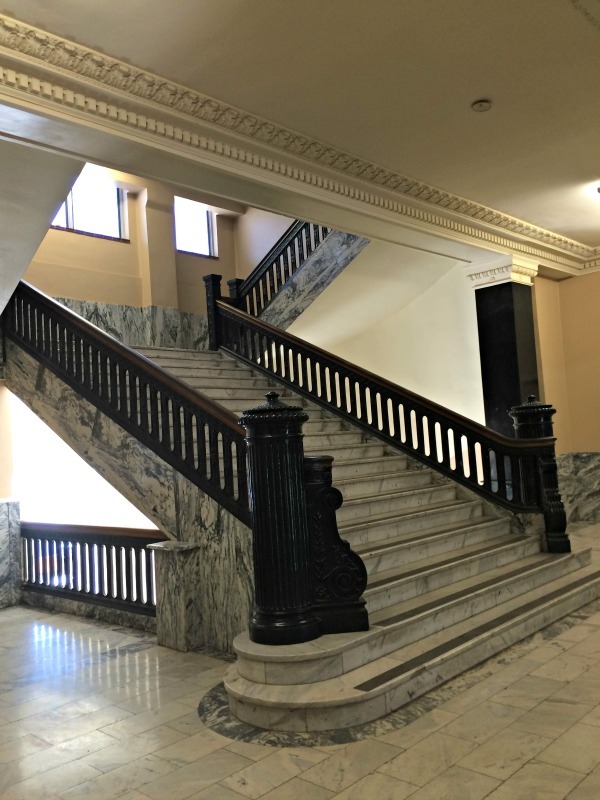 In 2001, a master plan for a courthouse renovation was submitted to the THC's Texas Historic Courthouse Preservation Program (THCPP) and the plan was approved. Today, the courthouse is worthy of a full restoration. “It’s a wonderful early 20th-century building and there’s a great opportunity here for the county to make seriously needed repairs with financial assistance from the state,” says Sharon Fleming, director of the THC’s Architecture Division. When ready, the 1915 courthouse renovation would be a perfect addition to the historical and cultural scene in Abilene—and to the restored historic county courthouses of Texas. Through matching grants, the THCPP helps preserve and restore Texas’ historic county courthouses to their original splendor and make them safe, functional, and a source of pride for Texas communities. To learn more about the benefits of restoring historic courthouses, download a free copy of the THC’s most recent Courthouse Cornerstones or visit the Texas Historic Courthouse Preservation Program. 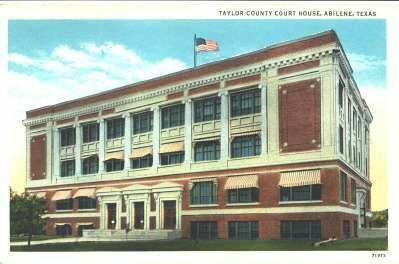 Postcard of the Taylor County Courthouse, circa 1930.